Recently, the CEO of Ecig.com announced that they are repricing all of their hardware at cost until they lose $1,000,000. It’s a crazy, but a bold strategy to win you over with their customer service. What this means is that you’ll get all the latest mods, clearomizers, rebuildable atomizers and accessories for the same price they purchased from the manufacturer. With that being said, this is one HUGE deal that you’ll want to take advantage of before the time runs out! One thing that a lot of you might not know is that there is no way to really advertise an electronic cigarette store online, outside of forums. With every business there is a CAC (customer acquisition cost). Most online companies will use Google Ads, Facebook ads etc. etc. Things’ that we cannot use in this industry. So we’re going to do it in another way. 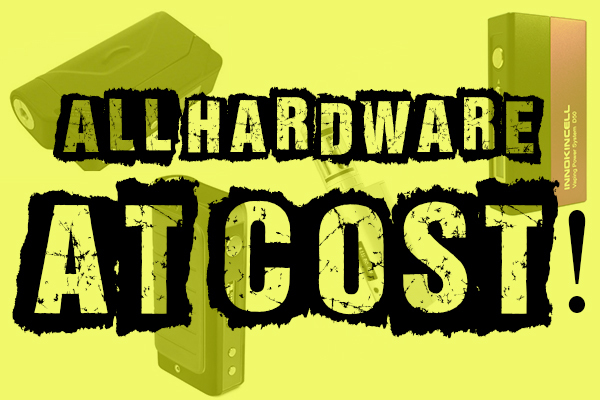 Starting tomorrow morning, we’re going to offer ALL of our hardware products AT COST until we lose $1,000,000. We’re putting a max quantity of 2 on all items for obvious reasons and we cannot set our juice prices lower as the manufactures would kick us out of their program very quickly. With this new plan in process I hope to gain a ton of customers and win them over with our AWESOME customer service. I truly feel that customer service is key in any business and we strive to have the best here, anything else is unacceptable to me. The prices are unbelievably low, and definitely something you’ll want to jump on. Just go look for yourself! Price: ALL hardware at cost. Conditions: 2 items per customer. E-Liquid is not included in the price drop. I may have posted this a little too early. The last time I spoke with Josh, he was still updating to the new prices, if too early, I apologize. For anyone wondering on the prices, just be smart and compare them with other websites out there. I looked in the RDA section when I was scanning over the site and a lot of them were priced super low – I didn’t check out everything on the site. From the looks of it this sale will LST forever, out of stock on the best items already. From what I’ve been told, this “deal” will only last until $1,000,000 is lost from lowering to cost. It wouldn’t be possible for them to keep these prices forever… they’re a business, they have to make money. This is merely an attempt to gain more exposure and more customers. And in my opinion, they’re going about it perfectly. I was thinking everything would go quick. However, I know for sure they’re in the process of adding tons of new products, so you all may be able to snag some of those up before time runs out. I checked a dozen products. 11 show “out of stock”. Hmmmm.